This post is the second part in a short series about the meaning of life. The series is working primarily off Gianluca di Muzio’s article “Theism and the Meaning of Life”, which appeared in the journal Ars Disputandi back in 2006. However, I’m trying to develop some formal reconstructions of Di Muzio’s arguments so as to improve my understanding of the arguments in this debate. My central contention, which is worth keeping in mind while reading this post, is that the debate is concerned with finding the necessary and sufficient conditions for a life that is worth living (i.e. meaningful = worthwhile). The previous post was taken up with addressing William Lane Craig’s claims about the role that theism and immortality play in making life worth living. Roughly, Craig argues that without God and without immortality there can be no meaning in life. Since neither of these things are present in the atheistic-naturalistic worldview, he concludes that that worldview is practically impossible: no one could continue living in the knowledge that life was meaningless. Burrowing a little deeper into his claims, we suggested that his argument reduced to the principle that one’s life can only have meaning if it plays a permanent role in some higher plan. I argued that this principle was flawed because, on the basis of some simple counterexamples, it appears that immortality and the existence of a higher plan are insufficient for meaning in life. This left open the possibility that there could be some other, non-theistic, account of the necessary and sufficient conditions for meaning. In this post, we will consider Di Muzio’s proposal for just such an account. As we saw at the end of the last post, there are really only two major possibilities when it comes to developing an account of meaning. The first possibility is to argue that everything has relative meaning. That is to say, it derives its meaning from something else. This possibility is unattractive because it leads to an infinite regress, something that Craig himself wishes to avoid. That leaves us with the second possibility: that some things are intrinsically meaningful. That is to say, they provide both the necessary and sufficient conditions for a life worth living in and of themselves. Theists may wish to argue that God’s higher plan is the only thing that could have this kind of intrinsic meaning. Without investigating any proposed divine plans (e.g. building an eternal kingdom) in detail, we already have some prima facie reasons to doubt this: many higher plans seem to lack intrinsic meaning, so why think God’s plan is any different. So let’s explore another possibility. The possibility that there are some things, here on earth, that are intrinsically worthwhile. Di Muzio argues that an obvious candidate for things that are intrinsically worthwhile are those things that are morally valuable. Indeed, worthwhileness and moral value seem to be natural bedfellows: to say that X is morally valuable seems to entail that it is worth doing. What’s more, this entailment relation would seem to hold even if the person pursuing that which is morally valuable has no role to play in a higher plan. There are two ways to argue this. One is to imagine an individual life — e.g. the life of the charity worker — which pursues something that is morally valuable but which, for some reason, is excluded from God’s plan. Then ask the question: would that life suddenly seem worthless if it lacked a role in God’s plan? Di Muzio says “no”: if there is recognisable value in what the person has done, then it would be absurd to deny that their life was worthwhile. This is true even for theists because they typically recognise that generosity and charity are valuable. Still, some hardy theists might resist the negative answer so there’s another tack one can take. Recall from earlier that God’s plan has to have intrinsic meaning lest we risk an infinite regress. So ask the question: what would make it the case that God’s plan is intrinsically meaningful? It can’t be simply because it’s his plan: that would be stipulative, arbitrary and vacuous. The only other possibility is that, in formulating and executing his plan, God is pursuing some goal or end that is intrinsically valuable. In other words, even the meaningfulness of God’s plan seems like it has to derive from the pursuit of something (some end or good) which is intrinsically valuable. This principle identifies for us the sufficient condition for meaning, namely: access to value. It should be noted that access to moral value is not the only thing that is included in this account. Indeed, classically it was held that three things have intrinsic value: the good, the true, and the beautiful. How exactly they manage to do this is a topic taken up in Thaddeus Meutz’s recent article in Religious Studies. I’ll not discuss these here. All I will suggest is that any life that has access to those things would, on the goods-based account, be meaningful. (1) If a person has access to intrinsically valuable activities in their lives, then their lives are meaningful (AVP). (2) Even if God does not exist, a person will have access to intrinsically valuable activities. (3) Therefore, even if God does not exist, a person’s life is meaningful. (4) Therefore, God is not a necessary condition for meaning. No doubt theists will wish to deny the truth of (2). They will argue that God is the ontological grounding of all that is valuable. Without him, there can be no access to value. I’ve already discussed this claim at length elsewhere. To summarise, I do not think it is plausible. I think values neither need nor require an ontological grounding of the sort envisaged by theists. Thus, this rebuttal does not work. So, with the help of the AVP and the preceding argument, we end up where we wanted to be: with an account of meaning that denies that God is either necessary or sufficient for meaning. In effect, we have now successfully defeated Craig’s claim that both God and immortality are necessary (and sufficient) for meaning in life. Still, there are some lingering doubts. In particular, there are some doubts about the role of immortality in our account of meaning. Even though we now know that immortality cannot in itself make our lives meaningful — the oft-cited example of Sisyphus pushing his rock up a hill for eternity is enough to show this — might it be the case that immortality provides additional meaning? In other words, might it be true that immortality makes life more meaningful than it might otherwise be? Many are seduced by this line of reasoning, atheists and theists alike. Consider the decision problems illustrated below. 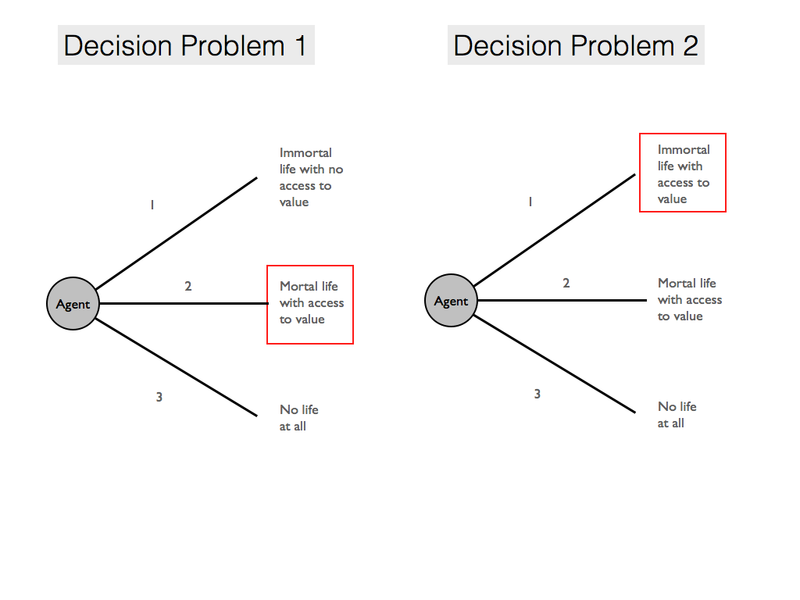 In the first decision problem, we must choose between an immortal life with no access to value (like the life of Sisyphus or an eternity in Hell), a mortal life with access to value, and no life at all. In this case, the preferable option seems obvious: the finite life with access to value would be more worthwhile than the others. 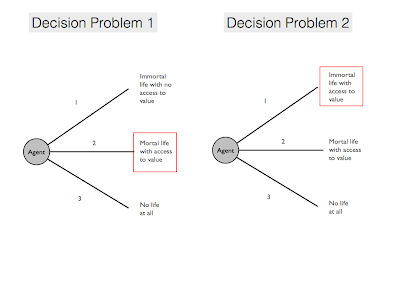 But things are not so straightforward in the second decision problem. There, we must choose between an immortal life with access to value, a mortal life with access to value, and no life at all. When confronted with those options we might be tempted to say that the immortal life is to be preferred to the mortal one. And this might provide a backdoor for the theist. How so? Well, the theist can argue that if an immortal life (with access to value) is more meaningful than a mortal one (with access to value), then God is the only being that can provide us with it. For what is heaven if not (on the common view) an eternal kingdom in which we can carry on accessing the values — love, friendship, family, the pursuit of knowledge — that we access here on earth, only forever and ever and ever. Di Muzio frames this argument in terms of something he calls “fragility”. Basically, he argues that the problem for the atheistic view is that our access to value is fragile. It can easily be taken away or reversed by calamitous events. He gives the real example of a group of children, happily playing in a yard, being bombed to death in Sarajevo in the early 90s. Although they lived in conditions that were sufficient for meaning (Di Muzio is clear about this), they did so for a fragile and fleeting moment. Would it not be better if they were given an immortal existence in heaven? (5) A life in which one’s access to value is fragile (i.e. can be taken away) is less meaningful than a life in which one’s access to value is permanent. (6) On atheistic-naturalism, everyone’s access to value is fragile (because we are all mortal). (7) On theism, at least some people’s access to value is permanent (because of immortality in heaven). (8) Therefore, life is more meaningful on theism than it is under atheistic-naturalism. Now let’s reiterate, this argument does not say that theism is either necessary or sufficient for meaning — the AVP is still doing all the heavy lifting in that regard. But it does suggest that there is more meaning in a theistic universe because it’s possible that God can create a realm in which access to value continues forever. As it happens, Di Muzio seems to be happy to reach this conclusion. His intent was to show that the theistic conception of meaning proposed by Craig fails, and that really the theistic view of meaning is parasitic upon the AVP. He does not need to go further and argue that theism is antagonistic to meaning. But I am not so happy to reach this conclusion. It’s not that I have any deep objections to it, it’s just that I think it’s worth exploring whether the above argument goes wrong at any point. And, indeed, there seem to be three possible flaws to me. First, premise (1) might be wrong. As Bernard Williams famously argued, an unending life might lose its worthwhileness by causing tedium: a dulling of one’s appreciation for that which is valuable. In a footnote, Di Muzio rejects this view, citing some more recent objections to Williams’ argument. There is a rich literature on this point that I don’t have time to explore today (perhaps some other day). Still, I raise Williams’s argument as being one way in which to rebut premise (1). Second, premise (2) might be wrong. There are several in the transhumanist community who are actively working on projects that would help us to defeat old-age and death. The most famous of these is, of course, Aubrey de Grey, whose views I discussed a while back. These projects may be largely aspirational at this point, but they nevertheless point to the possibility that (2) could be false. Some might object that even if those projects do succeed, we would not achieve true immortality since our lives would be constrained by the lifespan of the universe. There are two responses to this: (i) our universe may be future-infinite (I’m not sure what the best current theories say on the matter) and (ii) we would still have plenty of additional time to play around with, enough to make our lives seem very worthwhile indeed (perhaps more so than life in heaven, if one takes into account the problem of uncertainty to which I allude below). A more serious concern about these life-extension projects is that they may force us to become excessively risk-averse and thereby lose access to several otherwise valuable activities. So, in a sense, they might make us more aware of our fragility. Third, premise (3) might be wrong. After all, it’s possible that heaven is nothing like “business as usual”. What God has in store for us may not involve unending access to intrinsically valuable activities. I don’t know what else to say about this since any speculation about what heaven might be strikes me as being slightly silly. Presumably we just have no idea. But this very uncertainty might make the atheistic view (if it came with considerable life-extension) the more attractive one: better to go with what you know than take a risk on something else. That brings us to the end of this series. To briefly recap, in part one I (with considerable help from Di Muzio) considered the arguments of William Lane Craig about theism and the meaning of life. Craig proposes that meaning depends on whether one has a permanent role to play in a higher plan. If one has such a permanent role, then one’s life is meaningful; if one does not have such a role, it it is not meaningful. Craig followed this by arguing that, on theism, there is such a permanent role to play, but on atheism, there is not. I highlighted several flaws in this proposal. Using some thought experiments, I argued that having a permanent role in a higher plan was not sufficient for meaning. This suggested that something else provided the sufficient conditions for meaning. Following Di Muzio, a goods-based account of meaning was proffered. According to this theory, one’s life has meaning as long as one has access to things that are intrinsically valuable (the good, the true, the beautiful). Using some plausible premises, this account can then be used to show that God is not necessary for meaning. But there is a lingering problem for the atheistic view. While it may not be the case that God is necessary or sufficient for meaning, he might still make life more meaningful than it could be by providing us with an eternal realm in which we can access value (heaven). However, as we just saw, this argument may have its own problems.